The volume's topic was chosen in part because of the rapidly growing salience of dyadic research perspectives in developmental psychology, but also in social psychology and in fields such as communication and family studies. It provides the most complete representation now available on current theory and research on the significance of personal relationships in child and adolescent development. This volume addresses the ways in which the study of social development has been altered by an emphasis on research questions and techniques for studying children and adolescents in the context of their significant dyadic relationships. Leading scholars--many of them pioneers in the concepts and methods of dyadic research--have contributed chapters in which they both report findings from recent research and reflect on the implications for developmental psychology. Their work encompasses studies of relationships with parents, siblings, friends, and romantic partners. Opening chapters set the stage by describing the key characteristics of social-development research from a dyadic perspective and outlining key themes and contemporary issues in the field. It concludes with commentaries from distinguished senior scholars identifying important directions for future research. Contents: Preface. Part I: Historical and Conceptual Perspectives on Development and Relationships. W.A. Collins, Willard W. Hartup and the New Look in Social Development. 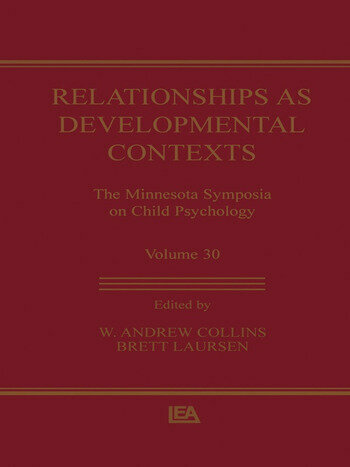 W.W. Hartup, B. Laursen, Relationships as Developmental Contexts: Retrospective Themes and Contemporary Issues. C.F.M. van Lieshout, A.H.N. Cillessen, G.J.T. Haselager, Interpersonal Support and Individual Development. Part II: Developmental Perspectives on Close Relationships With Peers. A.F. Newcomb, W.M. Bukowski, C.L. Bagwell, Knowing the Sounds: Friendship as a Developmental Context. T.J. Berndt, Friends' Influence on Children's Adjustment to School. D.C. French, K. Setiono, J.M. Eddy, Bootstrapping Through the Cultural Comparison Minefield: Childhood Social Status and Friendship in the United States and Indonesia. W. Furman, Friends and Lovers: The Role of Peer Relationships in Adolescent Romantic Relationships. Part III: Familial Relationships and Links to Other Relationships. E.E. Maccoby, The Uniqueness of the Parent-Child Relationship. E.M. Hetherington, Social Capital and the Development of Youth From Nondivorced, Divorced, and Remarried Families. R.D. Parke, R. O'Neil, Social Relationships Across Contexts: Family-Peer Linkages. L.A. Sroufe, B. Egeland, E.A. Carlson, One Social World: The Integrated Development of Parent-Child and Peer Relationships. J. Dunn, Siblings, Friends, and the Development of Social Understanding. G.B. DeHart, Conflict and Averted Conflict in Preschoolers' Interactions With Siblings and Friends. Part IV: Development and Relationships: Retrospect and Prospect. E. Berscheid, Commentary: Integrating Relationship Knowledge. C.U. Shantz, Commentary: Development, Modalities, and Relationships. R.A. Hinde, Commentary: Aspects of Relationships in Child Development. B. Laursen, An Annotated Hartup: Developmental History in a Personal Context. "This volume is an excellent contribution to the peer relationship literature, and is appropriate for graduate level seminars in developmental psychology and peer relations." "The heuristic power and conceptual challenges of relationship science are each thoughtfully captured in Relationships as Developmental Contexts....exemplifies both the promise and the prospects awaiting developmental scholars who hope to advance a concertedly relational perspective to developmental psychology." "Overall, the book is an outstanding treatise on relationships and 'must-reading' for anyone interested in developmental contexts."